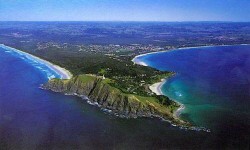 Byron Bay boasts some of the worlds most beautiful beaches ... Byron Bay, two hours drive south of the Gold Coast. This stretch of coast with its pristine beaches, lush rainforests and national parks is surely a paradise. If you enjoy a ctivities such as rainforest tours, bush walking, tandem sky diving, hang gliding, ultra light flights, Harley tours, cycling, canoeing, scuba diving, surfing, snorkeling, horse riding, deep sea fishing, vintage car tours and Australia's only flying trapeze school then Byron Bay is the place for you. Spend your evenings dining in one of Byron Bay's many outstanding, award winning restaurants then enjoy a local band or theatrical production ... or saunter along a tranquil moonlit beach pondering what your next day in paradise will entail. Byron Bay offers an array of accommodation packages to suit all tastes and budgets. Byron Bay accommodation offers a choice of 1 bedroom studio apartments and luxury resort style accommodation to large centrally located 3 bedroom fully self-contained apartments the choice is yours. Some places of interest in Byron Bay: Belongil Beach is a stunning open beach located north of the town centre. Clarks Beach is located at the southern end of Main Beach before the headland of The Pass begins. Main Beach is an extremely popular beach with a patrolled swimming area located at the end of Jonson Street. Tallow Beach is a 7km long beach which starts in the north at Cosy Corner running south through Suffolk Park. The Pass is a popular surf break for long boarders and is also where boats launch. The Wreck is a popular surf break created by the wreck of the SS Wollongbar. Wategos Beach is a smaller sandy beach located at the bottom of the Cape Byron Headland Reserve. Kingscliff is a seaside town just south of Tweed Heads on the far North Coast of New South Wales, Australia. 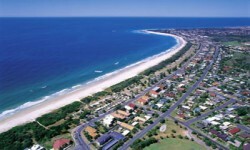 Kingscliff is an easy drive south from the Gold Coast and Coolangatta / Tweed Heads. Kingscliff is close to Mount Warning and World Heritage National Parks. Some of the best river and beach fishing can be found along the Tweed River. Just south of Tweed Heads, Kingscliff is a small beach community offering a wide variety of activities and accommodation for your holidays. Kingscliff has an abundance of cafes and local eateries only metres form the rolling surf and golden beaches. Together with the villages of Chinderah and Fingal, Kingscliff is a tourist destination to enjoy a variety of activities. Note the spelling - it is not Kingscliffe.